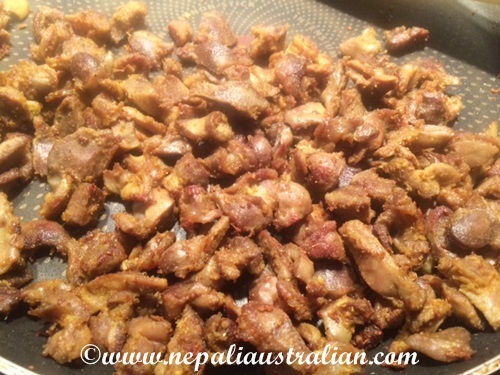 As I have mentioned in my previous post, in Nepal, a goat’s brain (gidi), feet (khutta), head (tauko), stomach (bhundi), tongue (jibro), liver (kalejo), kidney, lungs (phokso), fried intestines (aandra), fried solidified blood (rakati) are considered delicacies and are in very high demand during Dashain and other festivals. We also eat certain parts of chicken apart from the usual. I know some of you might feel squeamish even thinking about eating offal but believe me if you love your meat, you will love these dishes. Another thing is that eating offal uses the parts of the animal that might otherwise be wasted. As it takes 10 kilos of cereal to produce one kilo of meat we should not waste any part of the carcass. Unless you deliberately avoid meat, eating offal should be regarded as “green”. 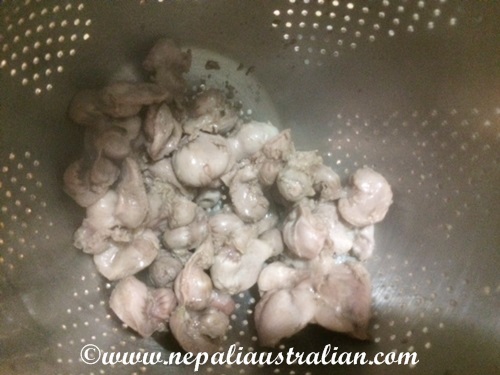 Today I am sharing the recipe to cook chicken gizzard. A gizzard is an organ found in the digestive tract of a chicken. Similar to a stomach, the gizzard is used to grind up the foods the bird eats. 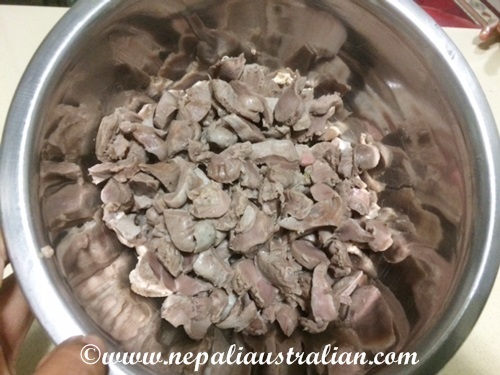 Eating gizzards provide a healthy dose of certain vitamins and minerals. Chicken Gizzard is a very popular appetizer and tastes really good. 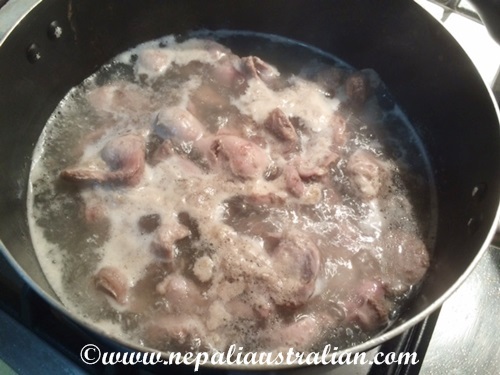 Clean the chicken gizzards and boil them for 5 minutes until they are tender. Drain them and let it cool for a few minutes. 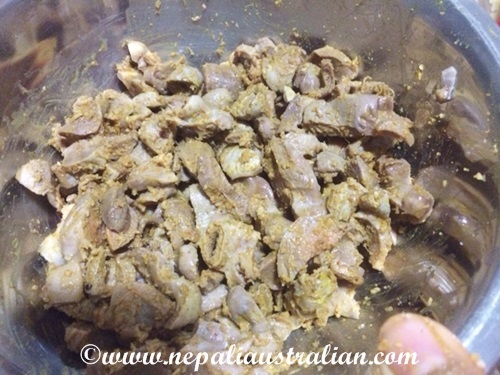 In a big bowl, add ginger garlic paste, cumin powder, coriander powder, turmeric powder, chilli powder and salt with chicken gizzard and mix them well. Heat oil in a pan and add the gizzard and fry for around 8-10 minutes. Keep stirring occasionally until they are brown on all side. Serve hot as an appetizer. P.S.S: If you blog about Nepal, please visit my new page . 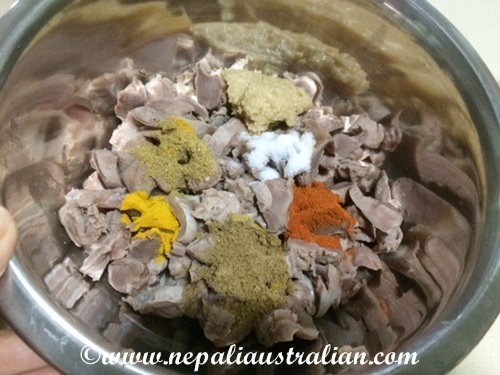 This entry was posted in Recipe and tagged Australia, australian, BioAge, exercise, Fitness, gym, health, M from nepaliaustralian, Nepal, Nepali, Nepaliaustralian, new mum. Bookmark the permalink. This blog isn’t for me, Australian. I can’t say I’m 100% vegetarian because I can manage fish and chicken breast as long as I don’t think about what I’m eating. I remember one time I was in an acquaintance’s home in Tebahal, Kathmandu and lunch was served. There were many dishes but one dish in particular was my favourite and I was happily eating it until the host told me that I was eating brain. Yikes I was better off not knowing and of course I couldn’t eat another mouthful. Have a great weekend, Australian. Will you go anywhere nice ? Here, barbecued chicken gizzard is a popular street food. That’s the only way I eat it, but this looks so good I want to try cooking it! By the way, I think you mean 500 g?